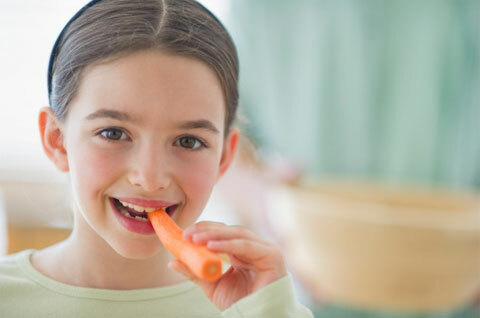 Nutrition Tips for Boosting Immunity - Energetic Juniors - Contact Us! No one likes to be sick, but with winter upon us we are entering prime time for colds, the flu, and other respiratory illnesses. Fueling your body with nourishing and healthy foods has long been understood to help prevent disease, boost immunity and increase overall health. Always aim to get a good balance of protein (such as poultry, meat, fish, or tofu), complex carbohydrates (such as whole wheat bread, brown rice, and sweet potatoes), and healthy fats (such as nuts, olive oil, and avocado). In addition, choose foods with immune boosting vitamins and minerals such as Vitamin A, Vitamin C, Vitamin E, and Zinc. Eat foods high in Vitamin A: A deficiency in Vitamin A is associated with impaired immunity and risk for infectious disease. Foods high in Vitamin A include: Sweet potatoes, spinach, carrots, red peppers and mangoes. Eat foods high in Vitamin C: Vitamin C is a highly affective antioxidant ( that helps protect the body from pathogens. Foods high in Vitamin C include: Papaya, bell peppers, broccoli, oranges, pineapple, and brussel sprouts. Eat foods high in Vitamin E: Vitamin E is an antioxidant and plays a significant role in the normal function of immune cells. Foods high in Vitamin E include: Sunflower seeds, peanut butter, almonds, tomatoes, and broccoli. Eat foods high in Zinc: Zinc helps the immune system work properly and may also help wounds heal. Foods high in Zinc include: Oysters, fortified breakfast cereals, beef, chicken, and pork. Stay hydrated! The dry winter air and our heated homes can make dehydration possible in the Winter . Getting adequate water is crucial because it keeps our body’s tissues moist, removes toxins and wastes from the body, and transports nutrients and oxygen to cells. Get adequate protein: Our immune system is made up of proteins including antibodies. Antibodies support immune system cells and can also attack viruses and bacteria that enter the body. Good sources of protein include: Chicken, lean beef, eggs, fish, beans, pork loin, and tofu. For more great tips you may contact Brown & Medina Nutrition at info@brownmedinanutrition.com or call 212-759-6999 ext. 100. Also check out their website at www.brownmedinanutrition.com.